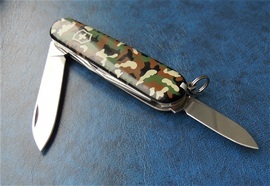 In 1987 Victorinox introduced camouflage handle scales. On the Picture is the Spartan 1.3603.94. The cool factor is very high with this knife and it is not boring. 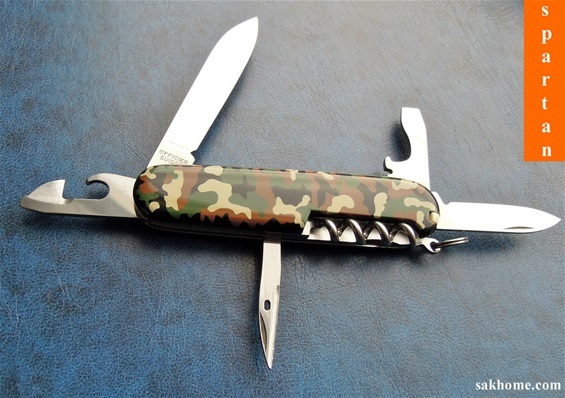 It is not a camouflage that got any other sensible uses other than the decoration, cool factor and that it goes well with the traditional Swiss Army Knife design. It fit very well in my opinion and I know military or some services like this design because of the work they are in. Even with the shiny surface of the camouflage and functions. It also fit some general outdoors design philosophies and designations. The absolute best in the outdoors on tools and handles is an easy to see color when it comes to traditional use and rescue. The Spartan is legendary today and it is known pretty much all over the world. It got the traditional functions and continues the great legacy of the 1897 officer knife. It got the standard type functions with the evolution from the beginning until our time window today. One of the advantages with the 91mm Spartan is a very lightweight and it takes little space. The 91mm functions are large enough for many tasks. It is many times used by people that have a minimalistic SAK EDC philosophy. One of the best advantages is also the price point. From what I have heard the camouflage handle scales got decent durability. It talks with positive and masculine energy. 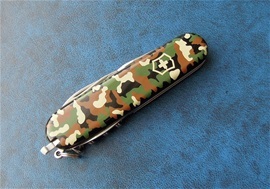 It is not only one type of camouflage done on Victorinox knives in history. There are a few different ones. 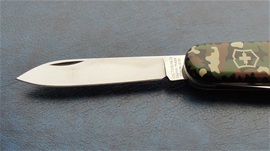 It is also possible to find this type on SAK from Victorinox with advertising also on the blade for military services and special departments. The Spartan configuration is one of the absolute most popular SAKs in history and i have seen this found its way for a great number of different philosophies of use. It can be found on any age group and so on. It can also be found in airforce survival-sets included. The Spartan is in many ways like the ancient Spartans in ancient Greece. The two blades and the functions can be enough to get the task done. Two blades in combination are tactical without any doubt. Both blades got precision design with the smaller even better for the finest tasks. Having one blade in reserve is very smart as well. Two blades in combination are what I used to build on the different tasks one may come across and develop reduction process philosophy. This is a method of getting the safest and most versatile functions for services for example. I use it to rule out possible problems and tasks that can become rather impossible for standard blades. Functions on SAK are designed to work single and in combination with each other in turn. For rescue for example two blades are the best. Only that this requires a larger configuration and design of the blades, OH and locking mechanisms added. There are several philosophies of use that can implement two blades. From experience i have seen an incredible number of SAKs. With some maintenance there are 0 problem with them for the use it is made for. Many forget the little blade and it is many times never used while the big blade no longer have any edge left at all. "It is also so that the 91mm SAKs can be used in combination with fixed blades and Multi-Tools. In general I can say that if you are looking for survival tools then there are some advantages with larger functions that can save time and requires less sharpening between maintenance. That said this depends on the correct use and that people know when to use the functions correct. Knowing when to use a curved serrated OH locking rescue blade or the plain edge OH locking blade + when to use the large wood saw to relieve. Most SAKs from Wenger and Victorinox are very well designed with correct designation for a specific configuration"
One time i did send a request to a special defense department in Switzerland asking about the logo used on the blade on a camouflage 91mm Victorinox knife. I was interested in finding out if this was an original knife used by them and for what. LOL, I know it may be difficult for the military to release or reveal such information. I did however get a reply in return and in a funny way too. The answer to my question was: You? It was a great reply and it is one of my absolute favorites. LOL there are two rather similar replies I have received during 14 years and I would not be without them.